No, he was not gaining with authority in the final yards of the Fountain of Youth (gr. II), as those critical of him point out, but to me that can be excused when you have to run your second and third quarters in :22 2/5 and :23 1/5 just to get within 7 lengths of the leaders and still come home in :24 2/5 and :06 2/5. Let’s not forget he blew by 8 other horses in the race and finished 4 1/2 lengths ahead of the fourth horse, so he was the only horse in the field to get anywhere near the first two, who are fast, talented horses who can carry their speed, especially on a such a speed favoring track. I have to admit he is probably the least accomplished horse I’ve had ranked No. 1 this late in the season, and I did toy with putting Cairo Prince back after his bullet work, but lifting horses to the top spot based on a work just confirms how screwy things are his year. Some day soon it will all make sense, but for now I have seen enough from this colt to believe we haven’t witnessed anything close to his best. Big move by Darley buying majority interest in the colt. All the dots seem to be connected now – McLaughlin to Sheikh Mohammed to Jimmy Bell to the pre-Darley Jonabell Farm to the recently pensioned Holy Bull. And, of course, he did win the Holy Bull. Interesting start for Godolphin’s new regime. Cairo Prince responded immediately by turning in a bullet 5-furlong work in :59 4/5 in company, fastest of 31 works at the distance. Although I’m still not used to these layoffs on the Derby trail and horses rarely showing their face, this colt’s reputation seems to be becoming more and more energized by staying in the barn and letting the others knock each other off. And Intense Holiday did boost his Holy Bull romp even further. Lost a little time after the Robert Lewis (gr. II), but finally returned to the work tab with a solid half-mile in :48 1/5 breezing, as he awaits the Santa Anita Derby (gr. I). Another going into his final Derby prep off a layoff and only two starts, which is becoming a trend this year. Same connections as San Vicente (gr. II) winner Kobe’s Back, who will stretch out and try to catch up to his stablemate by Santa Anita Derby time. What hurts is that Shared Belief annihilated both Candy Boy and Kobe’s Back. Sadler also has Sham Stakes runner-up Kristo working sharply for the San Felipe March 8. So, like Cairo Prince earlier this year, nothing to do but sit back wait for him to show up again. Right now, his resume says he’s still pretty much a guess, as we have no idea how good Chitu is or whether Midnight Hawk can bounce back. As mentioned last week, he’s ranked this high only because there is the chance he is something special. We pretty much know what we’re dealing with regarding the other leading contenders, but when they start surprising a veteran trainer like Baffert, as he did last time out, you have to think there’s a chance they are blossoming into stars overnight. We’ve seen it with dynamos like Big Brown and Bodemeister. But it won’t be confirmed until he continues his rapid ascent against top-quality horses in next week’s San Felipe. If he can handle that field or even run a big race against a highly regarded horse, he will shoot up to or near the top of most everyone’s list. One thing we’ve learned is that he’s not going to blow away his opposition and he’s not going to give you goosebumps with any electrifying bursts of brilliance. But he is always going to be coming at you and there is something to be said for sheer determination. But don’t think he’s some plodder who is going to pick up the pieces of a pace meltdown. In his last several races he has managed to throw in some brilliant fractions, whether on the far turn or in the final furlong, depending on where the jock wants to use it. The key with him is to time it right and not ask him to sustain his big run from too far out or you’ll get another Holy Bull type of result. To get the most out of him, it’s all about building up momentum by using his punch to get a good position, but saving enough to keep it going. He’s been pretty simple and straightforward his entire career. Never out of the money in five starts, excellent tactical speed, constant improvement, and back-to-back runaway victories, including a grade II score as a maiden. In short, he has done nothing wrong, and the way he crushed Strong Mandate suggests he has made great strides from 2 to 3. And a first, second, and third at Churchill Downs doesn’t hurt. For you Beyer followers, his figs have gone from a 68 to 78 to 83 to 98. The only question mark is pedigree, as both his families were best up to 1 1/16 miles and 1 1/8 miles, with a number of sprinters in his female family. Continued his excellent work pattern with a 5-furlong breeze in 1:00 2/5. His big test is coming up in the San Felipe, and we’ll finally find out how he fares against open company. I’m looking for a huge effort, despite the competition, and have moved him up two spots in anticipation of that huge effort. I love the way he moves and accelerates, and he is the only 3-year-old to have won carrying as much as 124 pounds. If he can defeat these horses or even run a big race, don’t expect to see him anywhere near No. 10 next week. He continued his sharp series of works at Los Alamitos, drilling 5 furlongs in 1:00 2/5. You never know for sure until they show they’re competitive against open company, but visually, he looks like a star in the making and a potential bargain at 32-1 in the Derby Future Wager. His impressive victory over General a Rod at Churchill last fall is looking better and better, and he followed that up by out-closing Intense Holiday for second in the Holy Bull (gr. III). Beyer pundits can’t be thrilled over the fact he’s never earned higher than an 85 speed figure, but the feeling here is that this colt has tremendous upside and just needs the right pace scenario and race setup to improve his numbers. If he handles the Tampa surface and gets a good trip in the Tampa Bay Derby, he should be right there at the finish. With his pedigree and new running style, expect to see continued improvement. Breezed an easy 5 furlongs in 1:02 1/5. Some no doubt will knock the :25 1/5 and almost :07 final 3/16 of the Gotham (gr. III), but that would be misleading. Compare the fractions of :23 4/5, :48 1/5, and 1:12 1/5 to Teen Pauline’s :25, :49 2/5, and 1:13 4/5 in the Top Flight (gr. II), and you’ll see they ran the opening quarter 6 lengths faster, the half 6 lengths faster, and the three-quarters 8 lengths faster, and Teen Pauline is the dominant older filly in New York. I love the way he was able to sit just behind the pace, and you have to marvel at his and Uncle Sigh’s ability to bounce out of that gut-wrencher in the Withers and engage in an even stiffer gut-wrencher in the Gotham four weeks later, with the brilliant, undefeated In Trouble thrown into the fray this time. And remember, he was giving 5 pounds to Uncle Sigh this time and jockey Jose Ortiz never touched him, cocking the whip slightly one time in upper stretch. He never even threw a cross on him, just hand rode him the final three-sixteenths. You love to see horses give that much of themselves without the need of any urging. These are two tough, courageous colts and you have to have tremendous respect for their resilience and competitiveness. I still believe in this colt’s ability and his scope for improvement. On paper, he hasn’t accomplished enough to merit elite status among the 3-year-olds, but I feel a breakout performance is imminent, as long as he finds the right spot and right scenario. It’s hardball time, as the points get tougher to earn, and he has none. My main concern is having only one more prep after a performance in which he did very little running until the end. So, he needs to get a tough race in him in top company, but more important, he needs to finish first or second to pick up much needed points. So his supporters can only hope he hasn’t been left with too much to do in a short period of time. His connections feel he may be more of a Belmont Stakes horse, so they’re not going to rush him to make the Derby. I will still keep him on here as long as I can, but next weekend could be a revolving door with horses coming and going. When you get down to it, he ran a super race in the Besilu Fountain of Youth (gr. II), considering he hadn’t run in 7 1/2 weeks and Wildcat Red had that bang-up performance in the Hutcheson after their Gulfstream Park Derby battle. He should be sitting on a huge effort next time. His Beyers have continuously leaped from a 65 to 81 to 95 to 101. not only is he out of a Dynaformer mare, which is all stamina, his fourth dam is Betty Lorraine, who is a half-sister to Kentucky Derby and Preakness winner Majestic Prince and who produced French Derby winner Caracolero and is the second dam of English Derby winner Secreto. Mike Maker has been very high on this colt, and you have to think there is a lot more still to come. I really wanted to put UNCLE SIGH in the top 12 this week, but couldn’t justify taking someone off, and his nemesis Samraat earned first digs at inclusion into the elite dozen by beating him again while giving him five pounds. And this way, I get more space to write about him. So, let’s consider Uncle Sigh No. 13 after his gutsy performance in the Gotham Stakes, in which he took all the worst of it, being caught in between two extremely talented and tenacious colts in Samraat and In Trouble and taking (and giving) a few mild bumps down the stretch, while in very tight quarters. And he was being ridden by Corey Nakatani for the first time, and Nakatani was in so tight he couldn’t go to the whip and could only wave it at him and throw an occasional cross. One of these days, if he draws outside Samraat, we’ll see if the result is any different. Although he’s been on or right off the lead in his three two-turn races, the feeling here is that he will go as far, or even farther, than Samraat and most other 3-year-olds, based in good part to a strong female family. His broodmare sire, Pine Bluff, won the Preakness and was narrowly beaten by A.P. Indy in the Belmont Stakes. Also, Pine Bluff is a full-brother to the dam of Kentucky Derby winner Fusaichi Pegasus. Uncle Sigh’s second dam is by Belmont winner and Breeders’ Cup Classic winner A.P. Indy, out of a Fappiano mare. And his fourth dam is by English and Irish Derby winner The Minstrel. That fourth dam, named Minstress, sold as a 2-year-old at the Newstead Farm dispersal for $1.3 million and went on to win or place in five stakes. The bottom line is, I feel we’ve only seen the tip of the iceberg with this colt and would expect to see further improvement in the Wood Memorial, if he, like Samraat, can bounce out of yet another taxing race the way he did the Withers. And kudos to IN TROUBLE, who ran his heart out to be beaten a half-length in only his third career start, first start over six furlongs, and first start in five months. And he drew the rail, which all but forced him to go the lead. No matter how hard Samraat and Uncle Sigh tried to crack him they couldn’t. It looks like Tony Dutrow has himself a gem. What a rematch we have in store in the Wood Memorial. In dropping CONSTITUTION after one week, I had to make room for Samraat, and as I look at his possible itinerary, I’m finding it difficult to see how he can make it to the Derby with more than three career starts, and unless you’re a freak like Big Brown in an off year, three career starts just isn’t enough to be ready to go 1 1/4 miles on the first Saturday in May. This is a very talented horse with a bright future, but he may be one race too short. Pletcher prefers four to five weeks between races, so we’ll see how it plays out. STRONG MANDATE showed that his erratic-running Southwest defeat didn’t take too much out of him by breezing a half in a bullet :48, fastest of 31 works at the distance. You just never know what you’re going to get from him. His highs are very high, but he has to display them more consistently. Before you totally give up on MIDNIGHT HAWK after his disappointing third in the Robert Lewis, be aware that he is quietly strutting his stuff in the mornings, with his latest work a blazing 5 furlongs in :58 4/5, second fastest of 82 works at the distance. We’ll see how he fares against stablemate Bayern and the others in the San Felipe. SPOT has made quite a dramatic turnaround since being purchased by Joseph Moss and sent to Nick Zito, who ran him for the first time since his well-beaten fifth in the Hutcheson Stakes, and the son of Pulpit proceeded to blow right by 2-5 favorite NO NAY NEVER to win the Swale Stakes going away by 2 ½ lengths. Boy, would Zito love to have gotten this colt a little earlier in order to get a couple of two-turn races in him. Now, it’s pretty iffy that he’ll be prepared to go 1 1/4 miles on May 3. We’ll see if Zito even has thoughts of roses at this point. But either way, it’s good to have him back with a talented 3-year-old, who does need to learn to change leads. Look for Todd Pletcher to give GALA AWARD a shot at the Blue Grass Stakes and a chance to make it into the Kentucky Derby following his hard-earned victory over MR SPEAKER in the Palm Beach Stakes on grass. The son of Bernardini is bred for the dirt and all his works have been on dirt, so if the shoe fits. The latter turned in a powerful stretch run and appears to be best on grass, but with his pedigree and overall class, I’d love to see him get one more shot on dirt, despite his poor effort in the Holy Bull. He was on Lasix for the first time in the Palm Beach and there really isn’t anything of note on the grass for 3-year-olds this time of year. 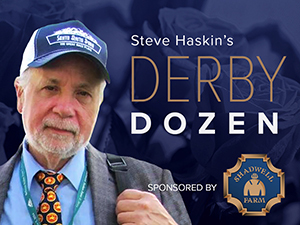 Yes, McGaughey is loaded with a pair of Derby aces, but neither one is a Phipps colt, and you can bet Shug would love to win the Derby in the Phipps’ colors. SOLITARY RANGER made it three-for-six with an authoritative victory in the John Battaglia Memorial at Turfway, in which he opened an eight-length lead at the eighth pole and coasted home under a hand ride to win by 4 3/4 lengths. The son of US Ranger has made five starts on synthetic and one on grass, so his dirt status is questionable as he likely heads to the Spiral Stakes. Two horses to watch down the road are impressive allowance winners ANCHOR DOWN and THE TRUNK MONKEY, both of whom were impressive, but were making only their second career start. Anchor Down defeated a solid allowance field, zipping seven furlongs in 1:21 3/5 at Gulfstream for Pletcher, while The Trunk Monkey took advantage of a main track only entry by romping to a wire-to-wire 6 1/2-length victory going a mile and 70 yards at Fair Grounds for Larry Jones and Fox Hill Farms. Also this past weekend, TASHIR made it two huge wins in two starts at Calder, defeating a talented field in the one-mile Smooth Air Stakes. If the son of Afleet Alex was able to duplicate those efforts at other tracks, he could be a serious Derby contender. At Sam Houston, IBAKA made it four for six lifetime with a wire-to-wire three-length score in the Texas Heritage Stakes for Bret Calhoun. Todd Pletcher worked his two Tampa Bay Derby candidates, VINCEREMOS and SURFING USA, with the former going a half in :48 2/5 and Surfing USA in :51. Watch out for HY KODIAK WARRIOR at Tampa. This colt is consistent and has a good closing kick and finished only two lengths behind Top Billing in his last start. He worked a bullet 5 furlongs at Calder and should be very dangerous in here. Jerry Hollendorfer told HRTV that 2-year-old champ SHARED BELIEF should begin serious training in a week, but hinted that the colt’s future may be down the road and that they are not going to push him to make the Derby. If the success of Candy’s Boy and Kobe’s Back, two horses Shared Belief annihilated last year, is any indication, the Derby trail is missing out on an extraordinarily gifted racehorse.